The HIPERTOUCH ECLipse trigger is the latest in a long line of performance triggers for the AR-15 platform, and it represents the pinnacle of the HIPERTOUCH line of competition triggers. If you read my previous Spotter Up article on the HIPERTOUCH EDT3 from HIPERFIRE, you will know that i came away from that review with a very high opinion of HIPERFIRE products, and also as a company comprised of good people. The engineering behind the products is original and performance driven with a focus on reliability as to be fit for duty weapons. The ECLipse is latest version of competition triggers that started with the HIPERTOUCH 24, which spawned its own series of triggers with different features, but based on the same excellent design. The “24” stands for 2-4 lb adjustable triggers, and the ECL sports 15 user adjustable trigger weights. This series of triggers also benefits from the same improved mechanical advantage of the other HIPERTOUCH triggers, and also incorporates patented “over-center toggle springs” that help reduce sear friction without reducing hammer fall speed or impact energy. The result is a very short, clean and light single stage trigger pull that doesn’t sacrifice reliability. The ECLipse trigger takes the 24 competition trigger to the next level by adding a nickel alloy finish which serves to eliminate all hints of pre-travel (also referred to as “creep”) prior to the trigger breaking and gives the shooter the smoothest feeling action you could ask for in an AR trigger. As with the other triggers in the 24 series, this trigger does not sacrifice reliability for excellent performance. What you are getting with this trigger is an adjustable, exceptionally clean, crisp break with no creep and an extremely short reset, but more importantly in a reliable fire control group (FCG) that you can count on. Having a sweet trigger in your AR that feels so nice and enables you to shoot faster splits is awesome. But the reliability of knowing that the hammer will drop on that firing pin with enough force to ignite the primer of whatever you try to feed it is something you can’t put a price on. Installation: The ECLipse came packaged in the standard HIPERFIRE wrapping, which included the hammer and trigger assembly, springs, pins and the patented parts related to the toggle spring assembly. HIPERFIRE also includes detailed installation instructions which i appreciate. The installation process is the same as a standard AR trigger system, with a couple small differences. 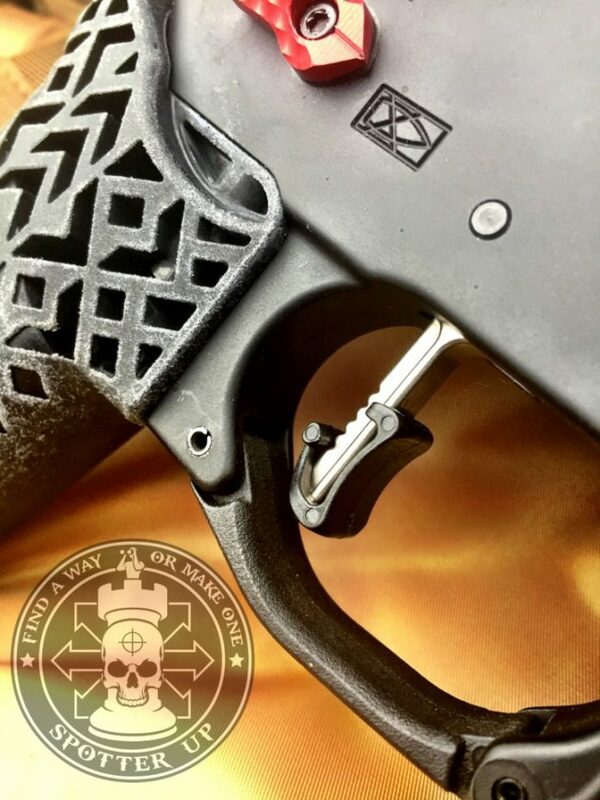 If your trigger guard is fixed, you have to install the trigger shoe–if you desire it–before you pin the trigger into the lower receiver, otherwise there wont be clearance to fit the trigger shoe onto the trigger itself. The main difference in installation involves the toggle spring assembly, which i demonstrate in a quick video below. Once the trigger was installed and function tested with the lightest weight springs, I wasted no time in getting it out to the range. The first time I fired it live was at a local 3-gun match on Quantico Marine Corp Base in Northern Virginia, which seemed like a fitting place to put it to work. From a competitive standpoint I probably should have run it on a static range first in order to get the feel for it and practiced some drills in order to be ready for the match, but sometimes for the sake of efficiency in a busy world you have to simply “do it live”. I engaged the first two targets more slowly as i felt out the trigger, and then quickly realized how sweet of a trigger it was and rapidly engaged the rest of the paper targets on that first stage with smooth controlled pairs. 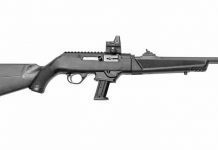 As you can imagine from the function test video above, the ECL trigger enables your ability to shoot rapid strings of controlled fire with minimal disruption to your sight picture–assuming your other fundamentals such as recoil control are working correctly. 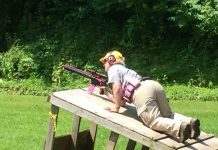 Essentially, the tangible result of running this trigger correctly is slightly faster split times, and the ability to get fast, accurate hits on target a little easier. In the video below, i demonstrate several rapid (and accurate) strings of fire, controlled pairs and also a long distance stage where i was able to get first round hits on three targets at 200, 225 and 250 yards (using 62gr match ammo). The creep-less, crisp and lightweight trigger pull and minuscule reset really make this trigger ideal for competition shooting. Ultimately i was able to run this trigger in a several multigun matches and put about 1000 rounds of various .223 through the rifle with no issues to speak of. I would have liked to run this trigger in many more matches before writing this article but my work schedule and a 6 month deployment got in the way. I’m looking forward to continuing to put this trigger through its paces when I return CONUS in Fall 2017. Stay tuned to Spotter Up social media accounts later this year for more.